The Tampa Bay Lightning, who spent most of their regular season scribbling in the record book, is in trouble. 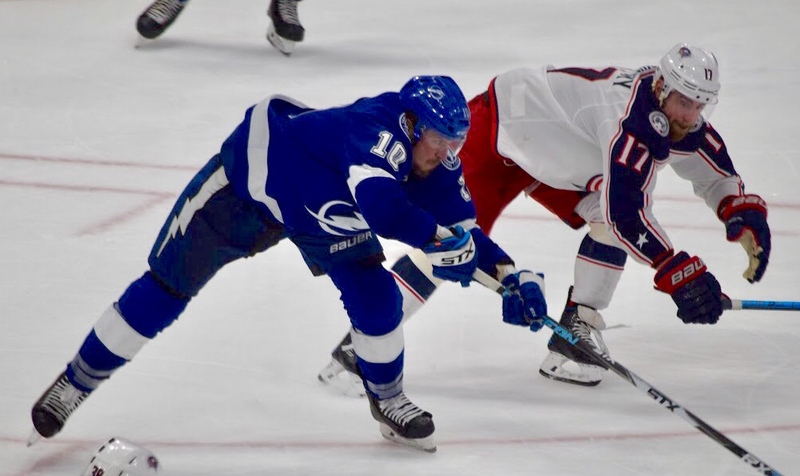 The Bolts, losers of back-to-back games only twice all season, lost their second straight playoff game to the upstart Columbus Blue Jackets on Friday night, losing a lopsided 5-1 decision that left you wondering if the playoff pressure has gotten to them. The Blue Jackets, who qualified for the playoffs on the final day of the regular season, scored the first three goals of the game and coasted. Columbus now returns home for two games and, if successful, could end the Bolts' season on their home ice. “We’re in a tough position, but we’re not going to quit," said captain Steve Stamkos, who failed to score again. "We’ve got to take a page out of their book and go on the road and win a hockey game. We just got to focus on Game 3. It’s tough, it just hasn’t gone our way right now. The Bolts had an historic regular season and three 40-game goal scoresr and the league's leading goaltender in wins. But they haven't been very good in the playoffs. Tampa Bay now must win four of the next five games to win the series. Otherwise, it will be a staggering upset. "We had a tremendous regular season, statistic-wise," Lightning coach Jon Cooper said. "Both our special teams finished first, but the regular season is different from the playoffs and things just happen so fast and, all of the sudden, it's 0-0 and there's a lot of excitement going into Game 1. Then all of the sudden you’re down 0-2 at home and alarms are going off. sometimes that's good, sometimes you have to go through stuff like this. We'll see how we respond. The one thing I do know about being with this group is, they find a way and I'm sitting here and we're going to be in Columbus 48 hours from now and there's no other bench I want to be behind but ours, that's how much faith I have in this group." Still, the Jackets seem in control, clogging lanes, forcing the puck deep. “I think they did a really good job of stopping our speed and clogging our neutral zone up a lot," said defenseman Dan Girardi. "That’s a good play by them. We’re trying to get some speed and get pucks deep, but we don’t get it behind them, they turn it quick and had some transition. We’ll go back to the drawing board here, watch some video and figure out what we can do better in Game 3. For the Lightning, however, it isn't a matter of deciding to win. It's how to play better enough to win. Once again, much of the focus will be on the struggles of Stamkos and Nikita Kucherov. Cooper tried to deflect blame. "If you look in the 82 games -- and I know they've had success point-wise -- but they have gone two games in a row without scoring," Cooper said. "It's unfortunate that it's happening in Game 1 and 2 in April of the playoffs, but last time I looked Kuch didn't have a point in all 82 games and neither did Stammer. So this happens, it's just unfortunate right now." The teams play Game 3 on Sunday at Columbus' Nationwidee Arena. The puck is scheduled to drop at 7 p.m.
Ok, now I’m worried and a bit angry! This team is better than this! What is going on? Are the Bolts being out coached? I was looking for the team that won the President’s Trophy to show up out there. It didn’t happen! So Gary, what are the odds of them pulling this out in Columbus? Slim to none would be my answer if they keep playing like this! It’s hard to blame a fan for being angry. The fan has invested a lot into this season, too. Yes, they’re being outcoached. But they’re also being outplayed and out-efforted and out everything else. In the last five periods, the Blue Jackets have been much, much better than the Lightning. Who ever thought we would say that? Look, the beauty of hockey is that it’s all ad-lib and free-flow. There are no breaks where a coach decides to go four on third-and-one or decides to pinch hit another batter. All he can really do is juggle his lines and stress the key points of his gameplan. Still, it isn’t like the players are doing bad and the coach is doing wonderful. They’re all disappointing. So I guess the President’s Trophy and a record-setting season is what this team will be satisfied with. If not then the real Tampa Bay Lightning had better show up for the rest of this series because I don’t recognize any of this bunch! Bill, this team is capable of winning four of five. But, no, the team won’t be satisfied. They know why they play. If they lose in the first round, it was be as disappointing to them as the reason us. Sadly, I do recognnize them. This is the team that played with Art Williams owned the team. Previous post: Ask Gary: Are the Rays good enough at trading?